I’m not sure if you caught it. In this past episode there was the faintest hint of the very subtlest of symbolism. It probably went over most people’s heads. But guys I think the Doctor Who team is trying to say something on immigration and extremism. Perhaps. This episode starts with Osgood. I HATE Osgood. I hate everything she stands for in the Doctor Who fanbase. The references to other doctors, her fangirl-ness, her inhaler. As you’d imagine I was just thrilled to not only have her back but to have TWO Osgood’s. They give a bit of exposition about the Zygons from ‘The Day of the Doctor’ which is a good idea because that plot hole has been lingering. They cover her death (anyone else find it weird the grave just said “MY SISTER”?) And whilst it’s perhaps a little clunky, I don’t mind. It brings everyone up to speed. And then in present day we see her get captured by no-ones favourite villains, the Zygons. The big problem here is that the Zygons are not scary. They’re not a threat. Even with the electric hand thing they’re still not remotely threatening. They look kind of, well, crap. It’s up to the Doctor to save Osgood and stop a new splinter group of radical Zygons. And this SHOULD be awesome. The pieces are all their, Osgood is out of the picture for now, this should be awesome. And some bits are. The locations are great. Truth and Consequences is an original location (and when using it for research for my own script in University, I wondered why no one had used it before) the caves under London are visually interesting and the fictional town the Doctor ends up in as fun. But the characters just feel so dumb this episode! The squad of UNIT soldiers being tricked into the church by the Zygons was the most frustrating thing I’ve seen in recent Who. There was the building blocks to create a great scene there but they squandered it. Then again, this was the same man who told us the moon was a giant egg. 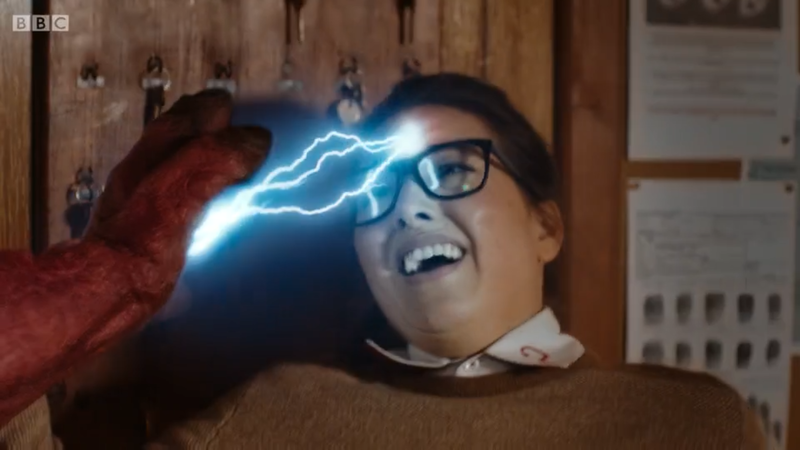 Ok, so the symbolism was as obvious as a Zygon electric hand to the face (see above), but was it a good idea? We had drone strikes, immigrants, hostage videos and Zygon training camps. I’ve seen people saying it wasn’t meant to be subtle, that it’s a brave analogy but that doesn’t sit right with me. It got in the way of the rest of the story. It concentrated so hard on mirroring terrors of today that it just came across as silly and out of place. it all just felt kind of wrong, and a little in bad taste. The Doctors joke about the Zygons stealing your benefits was funny though. Speaking of, Peter Capaldi was great as usual. 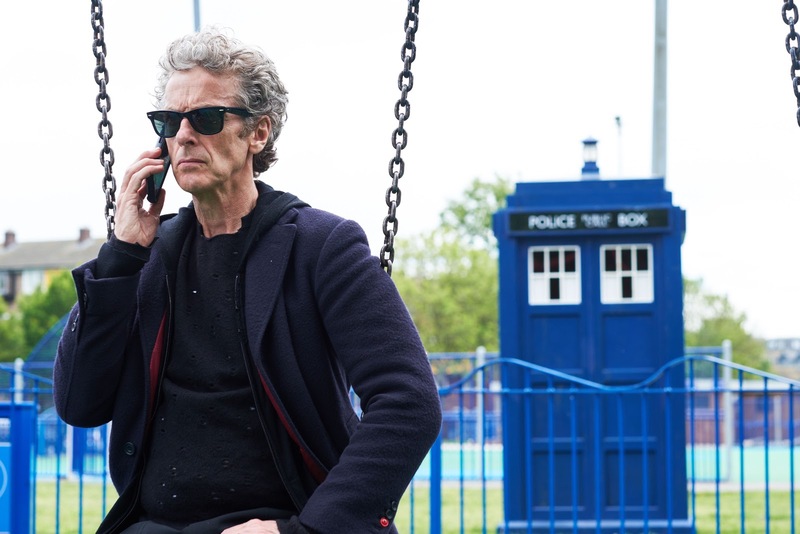 He’s still rocking that electric guitar and it seems like that might be becoming one of the 12th Doctor’s ‘things’. Much better than bow-ties in my book. it was also really cool to see Rebecca Front back acting alongside her The Thick of It co-star. Hopefully we’ll get more of her next episode. And Clara was interesting this episode! Maybe I was slow but I didn’t guess the twist. Jenna Coleman seemed to be having a hell fun being evil and she looked pretty awesome with that rocket launcher. It’s difficult to judge, because so often the second half will complement this half and it may work as a whole. If that’s the case then the second episode has a lot of work to do. ‘Invasion of the Zygons’, for me, is the weakest episode so far. The direction felt quite weak, the amount of dutch angles made it feel like I was watching Battlefield Earth at times. And there was too much of them trying to be current. The thing that leaves the bitter taste in my mouth is that this episode, more than any I can remember, wasted so much potential. It could have interesting to see soldiers not sure if they were aiming at friend or foe, but it was done in a lazy and frankly embarrassing way. The soldiers and the hesitant drone operator felt like parodies. Luckily the Clara story was interesting, and the subplots were good. Peter Capaldi held things together also. It’s nowhere near one of the worst episodes of Doctor Who, but it certainly is one of the most disappointing. I must admit we found it a bit of a trial, I actually felt almost bored and my daughter said, “Those railway tunnels get used a lot in Dr Who don’t they?” I think we all know that Peter Capaldi can play the electric guitar, but between the glasses and the guitar I would give anything to have a sonic screwdriver back! I miss the sonic screwdriver too!